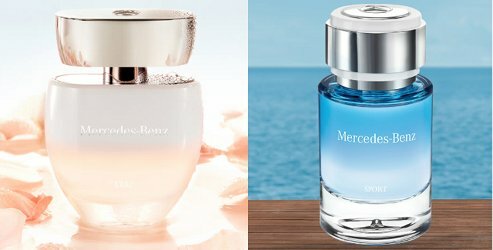 Mercedes-Benz has launched two new fragrances, Mercedes-Benz L'Eau for women and Mercedes-Benz Sport for Men. The last launch from the brand was Mercedes-Benz Club. Mercedes-Benz L’Eau ~ a flanker to 2013's Mercedes-Benz for Women. Developed by perfumer Michel Almairac, with notes of black currant, peach, bergamot, mimosa, rose, lily of the valley, amber, cedar and white musk. It is available in 60 and 90 ml Eau de Toilette. Mercedes-Benz Sport ~ a flanker to 2012's Mercedes-Benz fragrance for men. Developed by perfumer Olivier Cresp, with notes of mandarin, bergamot, galbanum, neroli, nutmeg, pepper, violets, moss, cedar and patchouli. It is available in 40, 75 and 120 ml Eau de Toilette.